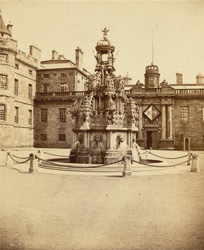 "In the front of Holyrood is an elegant Fountain erected in 1859, after the model of one at Linlithgow Palace. It consists of an octagon base with a large circular basin, and is divided into three stages in height. Throughout, the structure is embellished with beautiful work, representing animals in its lower part, while in the second are richly carved figures of musicians, which are surmounted by an imperial crown supported by four yeomen of the Guard. the whole fabric was erected under the superintendence, and at the expense of, the late Prince Consort, and adds greatly to the ornament of the Palace."